I'm Up Here Hoodie - This novelty hoodie comes in your choice of the listed colors, up to a size XL, and is under our funny hoodie section of our site. This novelty hoodie design tells people to look at your face and not your big chest. Our novelty hoodies are first quality hoodies. Our humorous hoodies are incredibly comfortable and this hoodie is made to last. All of these hoodies are in men's sizes so please order accordingly. 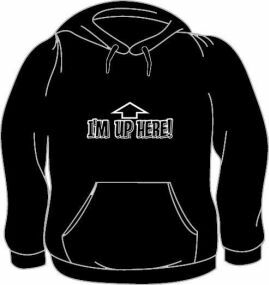 If you have questions regarding our I'm Up Here hoodie or any of our other funny themed tees, please email us with the product name and number.